One of the more unusual Kickstarter rewards Ruth offered for backing The Tembelaka Voyage- book 3 in the Blackfeather Chronicles- was tea she made herself! If you missed the Kickstarter, or even if you didn’t but are now out of tea, the Blackfeather Blend is back, and available to everyone! 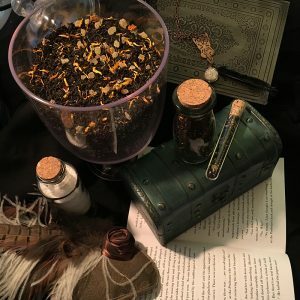 Check out the tea inspired by the Blackfeather books, as well as a whole library of teas invented and mixed by Ruth Lampi, over at The Five Wits .net!